The Wicker Man is considered by critics to be one of the finest British films of all time. It tells the story of Sergeant Neil Howie who travels to the mysterious island of Summerisle to investigate the disappearance of a young girl. Being a committed Christian, the police officer is distressed to see that pagan practices and traditions still flourish on the island. As his investigation proceeds, Sergeant Howie learns that he has been the victim of a great deception : the young girl is still alive and the story of her disappearance was designed only to lure him to the island so he could play a part in the island’s most important pagan ceremony – as a human sacrifice! Howie is imprisoned in a cage inside the Wicker Man, a giant human-shaped construct which is built each year and burned on May day. The story of the Wicker Man certainly makes for gripping cinema, but did our ancient British ancestors really practice their religion in this way? Were human sacrifices really performed inside giant, sinister Wicker Men? If so, how were the victims selected? Our knowledge of the ancient Britons is extremely limited. They left no written records of their own. The only contemporary written references to them we have come from outsiders. One of the most notable of these outside observers was the Roman consul Julius Caesar. Caesar confronted the Celtic inhabitants of Britain and France as he tried to impose Roman rule there, and learned a little of their culture. According to Caesar’s book The Gallic Wars, Celtic society was dominated by a class of priests known as the druids. Their religion involved the worship of nature in sacred locales such as groves and rivers. Both human and animal sacrifice formed a part of their tradition. According to Caesar, the Celts were highly superstitious and always keen to appease the anger of the gods. If they feared death, through disease or violence for example, they believed the threat could be deflected by offering another’s death instead – through sacrifice. But all lives were not equal. An animal life could not be traded for a human life, for example. To save a human, another human had to be offered up. For this purpose, the Wicker Men were used. Humans and animals would be enclosed in the human-shaped wicker cage - often several people at a time we are told, stuffed into every limb - to be burned alive in tribute to the gods. Serious criminals, such as murderers or robbers, were preferred as victims. But if none were available even innocents would be used! Historians counsel that Caesar’s words aren’t necessarily to be trusted. His writings were as much contemporary political propaganda as they were an authentic chronicle of events. His colourful description of the druids and their Wicker Men ceremonies may be no more than the historical equivalent of Saddam’s weapons of mass destruction that, we were told, were ready to lay our cities waste within 45 minutes. The truth is that we’re not sure whether our ancient ancestors used Wicker Men to perform human sacrifices or not. Archaeologists haven’t found any evidence of it but any such evidence would have been unlikely to survive the passage of time anyway. Evidence of ritually slaughtered people from around the same time period has been recovered from bogs, however. The environment of a bog acts as a preservative to some degree, protecting a body from some of the ravages of time. Caesar told us the Druids held natural places sacred. Did they hold bogs sacred too? Certainly, the evidence that they did indeed perform ritual human sacrifice goes a long way towards corroborating Caesar’s account. So maybe the ancient Britons did set up Wicker Men after all. 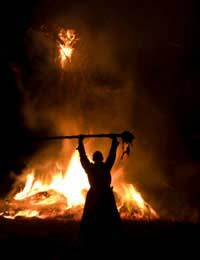 Recent years have seen a reawakening of interest in Britain’s ancient pagan traditions. As a result, it is now not uncommon, at festivals and religious ceremonies across the country, to see the darkness of British night illuminated by a burning Wicker Man again.